Tracked or normal delivery - please note you are only covered for loss on a tracked service. 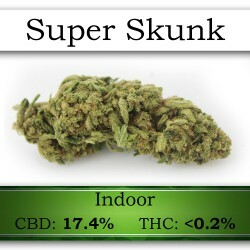 A predominantly indica variety, Super Skunk takes its robust flowers from its parent strain Skunk #1. By backcrossing the legendary Skunk with Afghani genetics, Sensi Seeds created a strain with dense, thick buds that are known to be extremely pungent with a surprisingly sweet taste.